The world’s first smartphone-based artificial intelligence (AI) engine, fully independent from back-end server communications. No server dependency results in minimal battery consumption. Understand user mobility and location 24/7 with no more than 1% battery life consumed daily. Optimize customers’ experience with relevant personalized offerings and real-time customer engagement based on their automated activity journal and holistic profile. More and more consumers are outraged that their private data is being exploited by marketers and stored in the cloud where it is more vulnerable to hacking. Anagog is changing this paradigm, putting users back in control of their data while still enabling marketers to reach the right consumers in the right place and at the right time with highly targeted offers. Anagog’s JedAI, a mobile SDK, enables consumer data privacy with advanced artificial intelligence solutions for smartphones. 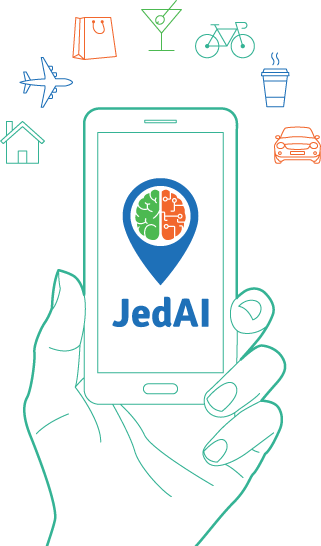 JedAI is the world’s first smartphone-based Edge AI engine that understands the mobility status and location of the smartphone owner, learns his/her unique profile on the phone itself and enables prediction of future activities and visits to places. All this is done without pulling any personal identifiable information (PII) outside the phone, hence fiercely protecting user’s data privacy. Users can benefit from better personal and contextual services without being forced to share any of their personal data.